As shown, the transmit polarisation, from the BUC on the left, is vertical. Receive polarisation is Horizontal. 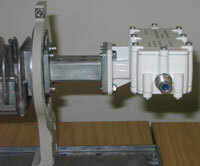 Hughes have released a new product in the forum of a universal Ku band LNB, pictured on the right. The module comprises a cross-pol OMT and LNB. 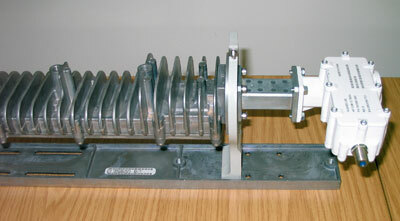 The LNB has a switchable local oscillator frequency, using a 22kHz tone from the HX50 modem. Two frequencies are selectable using a 22kHz tone. 22 kHz Tone OFF means the LO is 10600 MHz. we have a HNS HX hub here in Malaysia and the VSAT LNB is using 10600 MHz LO and the LNB 22 KHz switch is "OFF". 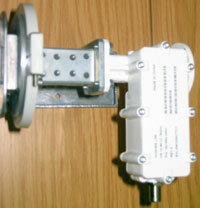 The overall satellite downlink band range covered by the LNB (HughesNet part number PN 1501882-0002) is 10.95 - 12.75 GHz. The lower local oscillator frequency will be used to receive the lower frequencies and the higher local oscillator will be used for the higher frequencies. When configuring the modem at installation, the installer must select a Receive LNB Type in the pull down menu. Radio Type: Receive LNB type. The /cfg0/sbc.cfg should cause an LNB option to appear that will look similar to this "XXXXX UNIVERSAL"
The information for this page has been kindly provided by Bentley Walker who operate HX networks covering Europe, Africa, Middle East, including Iraq, Afghanistan, Pakistan and Kazakhstan. Page new ECJ 11 May 2010, amended 14 April 2016, 6 Feb 2019 HTML5.